Celebrities call on Scotland to get Red Nose Day ready! Today (Thursday 31st January) Comic Relief can exclusively reveal new details about this year�s Red Nose Day campaign, with information about this year�s Noses, T-shirt designs and the big night of TV released for the first time. Jessie J, Stella McCartney, One Direction, the team currently battling the Zambezi and many more celebrities are all doing their bit for this year�s Red Nose Day and now it�s time for everyone in the UK to buy their Nose and get ready for a bumper Red Nose Day, in this its 25th year. People from all over Scotland are being urged to wear their Red Nose with pride and do something funny for money. The money you raise helps people right here in Scotland. Since the last Red Nose Day, more than �4.5million has been spent on 205 projects across Scotland. In the past 25 years Comic Relief has approved over �22,000,000 in Scotland and funded over 1,000 projects. Jessie J is shaving her head to raise lots of �money, money, money� for Red Nose Day and Comic Relief can today reveal that she will be shaving her hair down to 0.5mm, live on the big Night of TV on BBC One on Friday 15th March. Jessie J is part of a team of celebrity Fun Raisers who will be encouraging the nation to do something funny for money. Jessie�s preparations for her big Dare are well underway with the pop sensation pictured getting lathered up with the help of some Red Noses. There are three different Dinosaur Red Noses to choose from this Red Nose Day, all available from Sainsbury�s, Sainsburys.co.uk, Oxfam or rednoseday.com. They�re the first Noses with toes, so the public should hurry before they run out. This year marks the 25th anniversary of Red Nose Day and on Friday 15th March the BBC will host a truly unforgettable night of TV: Red Nose Night. The night of TV will be hosted by some of Britain�s top comedy stars including Michael McIntyre, Rob Brydon, John Bishop, Zoe Ball, Lenny Henry, Davina McCall, Jack Whitehall, Nick Grimshaw, Jonathan Ross and Claudia Winkleman. The show will also be packed full of pure comedy gold with sketches from the Call the Midwife cast, Rowan Atkinson as the Archbishop of Canterbury, Fresh Meat and a special Russell Howard�s Good News. 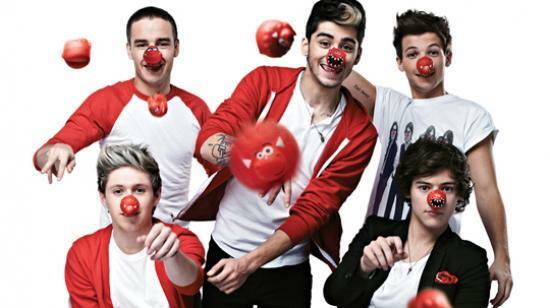 The world�s biggest pop band, One Direction, has recorded this year�s official Red Nose Day single, One Way or Another. The band will perform the single, a cover of Blondie�s 1978 smash hit, for the first time at this year�s BRIT awards on Wednesday 20th February. The single can be pre-ordered for �0.99 on iTunes from today (31st January) and will be released on iTunes on Sunday 17th February, the CD will be available to buy in Sainsbury�s from 18th February. Melanie C, Jack Dee, Chelsee Healey, Phillips Idowu, Greg James and Dara O Briain just couldn�t wait to do their bit for Red Nose Day and are already in Africa battling their way through the brutal BT Red Nose Day Challenge: Hell and High Water. The celebrities are making their way down the Zambezi River to Victoria Falls as their endurance and survival skills are pushed to the limit. This year, Comic Relief has put together a team of celebrity Fun Raisers with one very important mission: to help the nation do something funny for money. Featuring Mary Berry, Jason Donovan, Lenny Henry, Jessie J, Keith Lemon, Miss Piggy and Helen Skelton, this team of celebrities has all the fundraising ideas anyone could ever need to raise stacks of cash this Red Nose Day. The fearless Blue Peter presenter Helen Skelton will be taking on seven huge challenges for Red Nose Day in seven different locations around the UK. All the action from Helen�s Magnificent 7 will be shown in a special seven week series on Blue Peter which starts tonight (31st January) and runs until Red Nose Day.